Herbal teas are a comforting, nurturing and healing way to rid yourself of a nagging cough. If you have a persistent cough due to sinusitis, allergies or a viral infection, try one of the best natural remedies such as a refreshing herbal tea. Many varieties are soothing to a cough, so you are bound to find one that you enjoy. Although annoying, coughing is your body’s way of ridding irritants from your throat and airways. If your body feels an irritant, it sends a signal to your brain for your lungs to expel a burst of air in the form of a cough. A persistent cough, or one accompanied by mucus, may be the sign of a deeper infection and should always be monitored by a physician. Some reasons for coughing are simply irritating, while others may be life-threatening. An herbal tea helps to soothe your irritated throat and bring relief to your persistent cough. Soothing a cough may help you sleep, work and live better. Warm tea helps to soothe your throat and it also helps to thin the mucus in your throat which can reduce the severity of your cough. Are a few of the most common and easiest to obtain herbal tea remedies for a cough. You can combine one or two teas together to suit your tastes and your health needs, or add different spices to your teas such as thyme, cinnamon or honey. Green tea is one of the oldest natural remedies. It also contains caffeine and can be helpful as a stimulant if your cold or cough has you seeking the comfort of a nap. The warm tea soothes your throat and also boosts your immunity as green tea contains a high proportion of polyphenols. You can consume up to two or three cups a day with limited side effects. Please speak with your doctor first as the tea may interfere with some medications. Caffeine-free alternatives are available for those who are sensitive to caffeine. 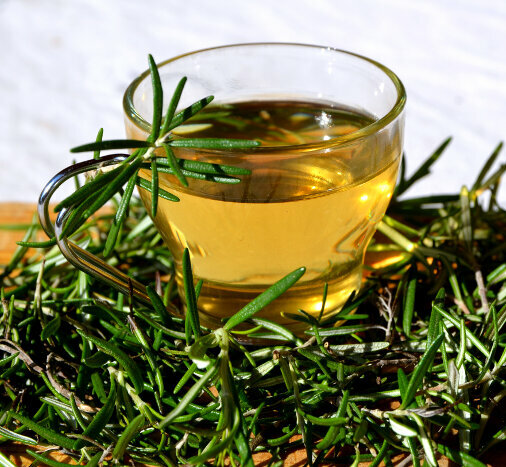 Rosemary is an herb whose oil is extracted for medicinal purposes. It is added to medicine and tea to enhance the flavor, but it is also beneficial for reducing a cough. It does have a chemical compound similar to aspirin, so those with an aspirin allergy should avoid rosemary. Peppermint tea is a common tea you can purchase at the store, or you can make your own by grinding dried peppermint leaves. Peppermint tea, Mentha piperita, is a good go-to for when you are not feeling well. The menthol in the leaves helps you to breathe better. Peppermint is also an anti-spasmodic so it reduces your urge to cough. The muscles in both your throat and chest relax when you drink peppermint tea. If your cough is the result of an infection, the antibacterial properties of peppermint help boost your immunity and lessen your cough. Chamomile tea is also beneficial for your reducing your cough. It is a relaxant and can help to reduce your urge to cough. According to the November 2010 issue of Molecular Medicine Reports, even inhaling the steam from chamomile tea is beneficial for reducing the severity of a cough. A small portion of people may have an allergic reaction to chamomile tea, especially if one is allergic to ragweed. Natural remedies for coughing will help you feel better. Not only will the herbs reduce your urge to cough, you will also soothe your throat and improve any underlying condition contributing to your cough. Always check with your physician before beginning a natural, herbal remedy.